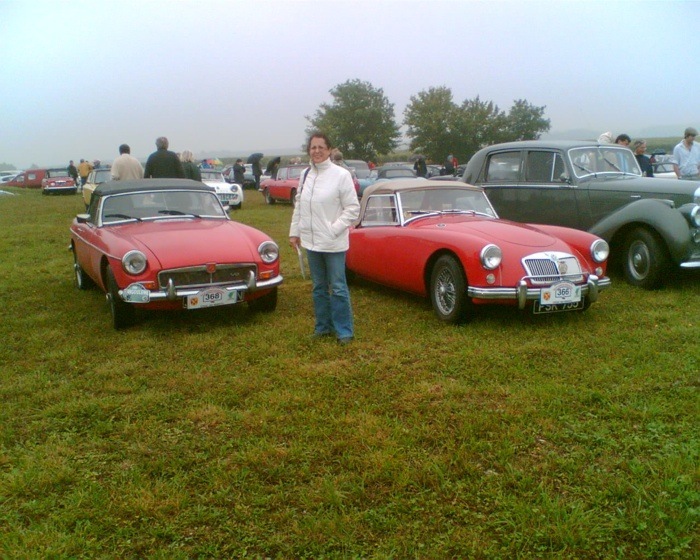 My partner Terry (Teresa) and myself own a MGB V8 Roadster. It was purchased some time ago, and after a year in storage, had a short life on the road before a full rebuild was decided on. As I was trying to rebuild another standard MGBGT at the same time the V8 did not progress very quickly. Whilst reading June's Enjoying MG I noticed the MGOC Angouleme September trip advertised. A thought came to me; if I have a target to work to I could finish both cars and take one to France on the trip. I sounded Terry out and she liked the idea too. The first month or so was spent on the White GT. The engine rebuild went well but my job kept putting me behind schedule. It soon became evident that I would not get both finished so as the V8's details had been submitted for the trip she was the one to be concentrated on from now on. The V8 suspension was rebuilt and wire wheels purchased. I will be fitting a stainless twin exhaust system and so had to arrange to get the car there. The twin system can only be fitted if the fuel tank is moved to the centre of the car, so my old drainpipe exhaust would not fit. I arranged to have the exhaust fitted on 6 Sept and booked a trailer to get it there. I now had 1 month left. 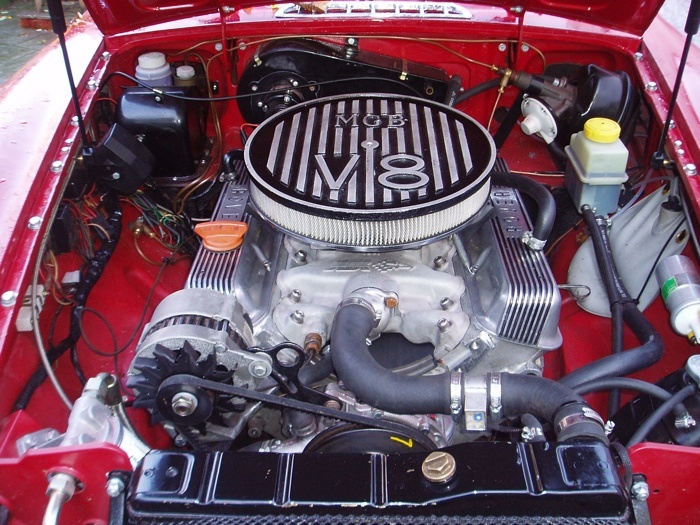 I had previously purchased a Stainless Fuel tank and had moved it to the centre of the car. The rear wings and sills were in good condition so I only had to replace the front wings and doors. 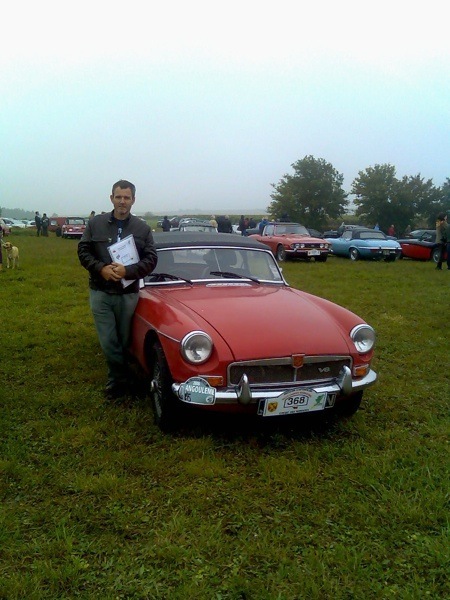 I had new heritage wings and 2 primered doors from an American MGB. The spraying had taken much longer than expected due to the amount of rubbing down needed as spraying in a tent at temperatures up to 130F was not easy, as I had never sprayed before. Before putting the engine in I had to fit the Power steering. This I was told would be a pain as all V8's differ slightly. They were right. It took some time but the guys in the MGOC workshop were very helpful and eventually the system fitted. It is a very simple system with only a few connections all mechanical, but it took some time to raise the engine enough to clear the rack, align the pump and modify the outer engine mount so the steering column could rotate through it. The engine went in easily and I fitted up a temporary exhaust so I could run it in before I had the new exhaust fitted. She ticked over first time but I was getting a very small leak from the top of the block. I thought it was from the inlet valley seals but after 2 replacements decided it was a bit more serious so would have to wait. I booked the car into RPI (who had sold me all the engine parts), for the day after the new exhaust fitting, so I would trailer it there too. The windscreen was re fitted with the aid of a few ratchet straps. Due to work commitments I was not able to do much more so the car was taken on a small trailer into south London to have the exhaust fitted. I had not tested the brakes or clutch and did not want to risk the fitter's safety so the prop shaft was removed. What a mistake. Having to reverse a trailered car in London through a petrol station forecourt to a small unit was a nightmare. Then we had to push it up on to the ramp!! Terry and I had decided to drive to Brighton whilst the exhaust was being fitted, but half way there received a call saying the garage did not have enough pipe to complete the job!!. Panic ensued but luckily when the chap realised he would lose the work all together he contacted another branch and the work was able to be finished. I was very pleased with the result, it was as quiet as they could make it, but still a bit loud. The ground clearance was fantastic as I had re-routed the brake pipes and electrical cables that go over the cross member, through it , so both exhausts could use the cut-outs to go as high as possible. Back on the trailer and home. Next day, car to Norwich to get checked by RPI. The heads were leaking. RPI could not repair them in time so I removed the heads myself. When I had rebuilt the engine I had used too much thread sealant and it had squeezed out between the gasket and block. Just to be safe I refitted the heads with composite gaskets to allow for any imperfections. The engine now ran fine with no leaks. It was now the 9th Sept. 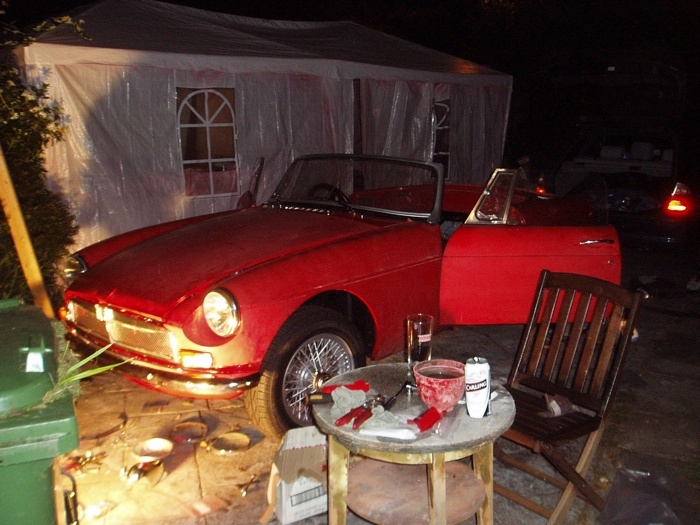 The car was still minus doors, interior, bonnet, boot, roof, front wings and trim. We would be leaving for the Ferry to Portsmouth on the 14th. We were not sure we would be going to France but with Terry behind me I took the week off work. Monday. a.m. Carpets and seats in. 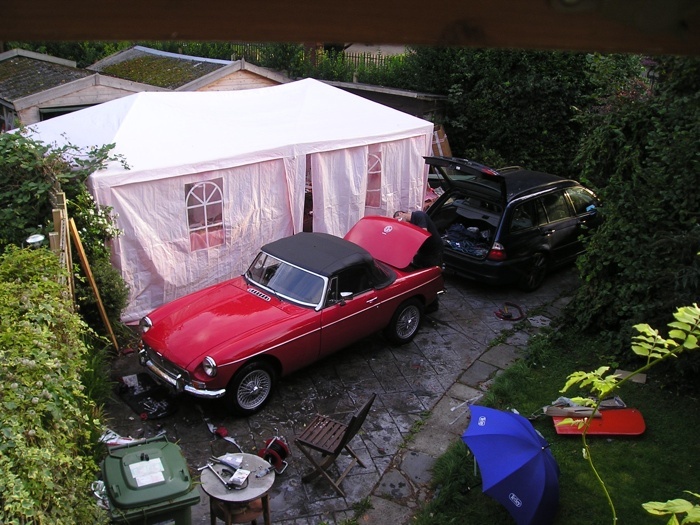 MOT was on Tuesday, and on Wednesday car was to have new hood fitted at MGOC. Tuesday lunch, I had fitted the wings, bumpers and seats, and all the electrics were connected up. The Old hood was fitted and the new doors adjusted roughly right. The electric windows had been fitted and manually set to closed. They would be wired up if time allowed. Two cans of fuel were thrown into the tank enough to get me to the MOT and back. Tuesday pm. Failed MOT on 8 counts. The car had not run properly and stalled on the examiner 5 times. Not so bad as feared as 5 were loose bolts on the suspension. 1 no mirrors (I had forgotten them completely), rear lights out( loose connection) incomplete wiping of the windscreen, and loose seats. I had passed on the engine and brakes. Wednesday a.m. Trip to have roof replaced was cancelled and car re-worked. Wed pm MOT pass. By now I was not sure if we were doing the right thing so we decided that we would continue right up to the last minute and if they were any problems during the trip down to Portsmouth we would stay in the nearest hotel and come home the next day. Electric windows were connected and worked. Terry was rubbing the front panels down to get them looking a bit better whilst I was adjusting the doors so they shut properly. The poor running was blamed on poor cans of petrol so the tank was filled up. ( for the first time). Bed about 11 pm. Thursday. Big smell of petrol. The tank was leaking badly from around the sender unit. I tightened up the 8 small nuts knowing that if 1 breaks then that's it, but the leak reduced to an occasional drip. This I could live with even though the exhaust was only 1/2 inch away. I fitted the inner door panels and door seal to stop as much water as possible. The whole boot was filled with tools and spares so we only took 2 soft bags rammed behind the seats. We were off, I had not even had time to wash my hands. Terry had done all the packing and everything else needed to allow our escape for the next 5 days. She drove OK but I had huge pinking under load. Too late to worry now. Half way to Portsmouth, flagged down by a van (very nice man) that had followed us for 10 miles. No lights at all at the back. This was not such a big problem as I had rewired her and knew all of the looms connection. Turned out to be a loose fitting fuse. Arrived at Portsmouth in one piece. 1 hour early. Fantastic. We saw one other car that was on our trip an RV8 but did not manage to talk to them. Frightened a few people trying to clear the throttle. Fitted second spring to throttle linkage arm to help. I think the carb had settled and was rubbing on the inlet manifold. We now found that Terry's door would not open from the inside and mine would not lock. Off to bed ready for the next trip. 350 miles on a new engine and car!! Friday AM - Absolutely tipping down. Behind us on the ferry was a MGA with no top. I now realised we were definitely not the maddest people there. After we had discussed the situation and where was the nearest hotel etc the obvious hit me, RAIN. I went back under the car and sure enough the pumps supply wire was facing the rear, towards the rear wheel. There was no sealing around the power cable entry into the pump. I wrapped a plastic bag around the pump and used my last 2 cable ties to secure it. Fantastic , for 8 miles then failed again. I was so disappointed I was sure it was water shorting the pump out. Back under the car. The plastic bag was now full of water. What a Wally. One drain hole later and off we went all the next 300+ miles to the hotel. The weekend was great. The weather was poor for all but the last day but fun was had by all. The car only let us down once but after a 5 min delay ran perfectly again. So all we had to do was get back. We had allowed the whole day to get to the ferry and were due to meet some newly made friends there. We arrived early and managed to get the earlier one, so unfortunately missed them. The fun was not yet over though. 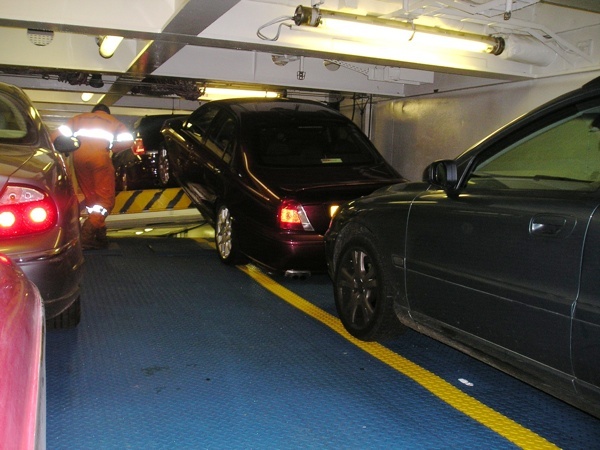 We had parked on the top ramp in the Ferry just behind the hinged portion that drops when the Lorries below are clear. As the floor started to pivot instead of dropping, one corner started to rise. One of the very nice new MG ZT's was astride this gap and their car was rising. As it raised up we all started to blow our horns as their bonnet was nearly hitting the roof and the tail pipe was about to hit the floor. The front wheels must have been nearly 1m in the air. The lady in the passenger seat jumped out of the car and nearly fell into the gap below the raised floor. There was about a 30-foot drop. It stopped just in time but took about an hour to manually lower. I do not think the car was damaged but surely the ferry company would have paid to dry clean their pants and the car seats. Our little girl took us home safely; ready to be finished off, this time with no time restrictions. If there is anything in this tale that would be of any help to any one please feel free to email me at davidtetlow@btinternet.com. Terry and I would also love to contact Denis & Julia in the MGB and Richard and Ceri in the E-type. Sorry we missed you on the ferry. Comments on "Angouleme Or Bust"
Great tale, hope to see you guys again one day.